Buying a house is one of the biggest investments that a person can make, but dreams of living in the perfect home can often cloud our judgment when a property hits all the right emotional buttons. Are you someone who pictures herself cooking Thanksgiving dinner in a dazzling gourmet kitchen, then serving up the feast to your friends and family in an expansive formal dining room? When you see a wood-burning fireplace, do you fantasize about spending a cold winter’s evening in front of a crackling fire with your beloved, or does an old claw-foot tub conjure visions of a luxurious, soothing bubble bath by candlelight? Each of us has a personal definition of the ideal home. For Nancy, who’d been house hunting for nearly a year, she thought she’d finally find a property that suited her to a tee. The quaint cottage had once been the gatekeeper’s quarters on a vast estate. While it showed signs of neglect, Nancy was sure the house had good bones. The minute she stepped across the threshold, she felt a welcoming rush of energy that seemed to make her feel as if she’d lived there her entire life. Each room seemed more enchanting than the next, but the clincher was the garden out back. Now weedy and overgrown, it had once been grand, and the idea of bringing it back to its former glory made Nancy nearly dizzy with excitement. While it did seem odd to Nancy that the house had been on the market for many months, she chalked it up to the fact that it was going to require some substantial updates to bring the plumbing and electric up to code. Undaunted, she put in a bid, and was elated when three days later, her broker told her it had been accepted. Had she been less emotionally attached to the house, it might have occurred to Nancy to question the fact that there had been no counteroffer, even though her bid was substantially less than the asking price. Contracts were signed, and Nancy began planning steps to feather her new nest, but when the home inspection report came in the following week, it dealt her a fairly heavy blow. While the house did indeed “have good bones,” according the inspector, it also had some fairly grave issues: the foundation was settling, which in turn had led to cracks in the walls and sloping floors. 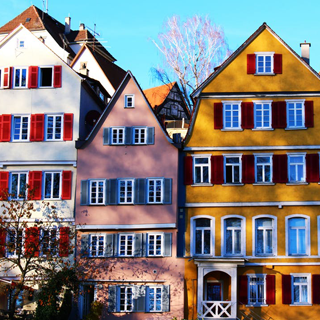 That wasn’t unusual in a house of this age, but the underlying cause would require a second inspection by a structural engineer to determine if it was something easily remedied, or more much serious. There was still time to pull out of the contract, but Nancy didn’t know whether to cut her losses, or follow her heart. 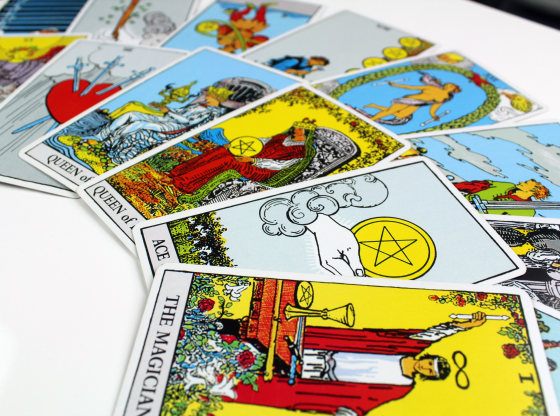 When Nancy called, it was clear there were two possible outcomes for her quandary, so I decided that the Two Path Spread would be particularly well suited to helping her determine her choices. 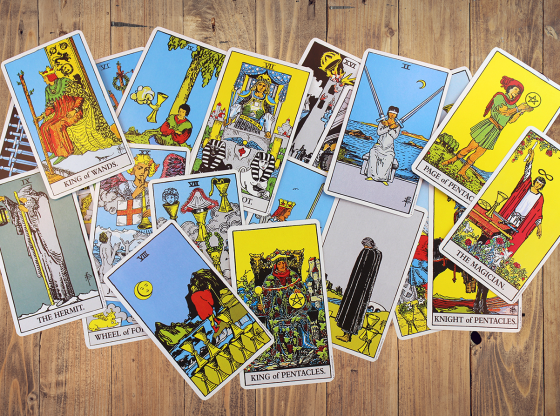 We both concentrated on her dilemma as I shuffled, then dealt out the cards. 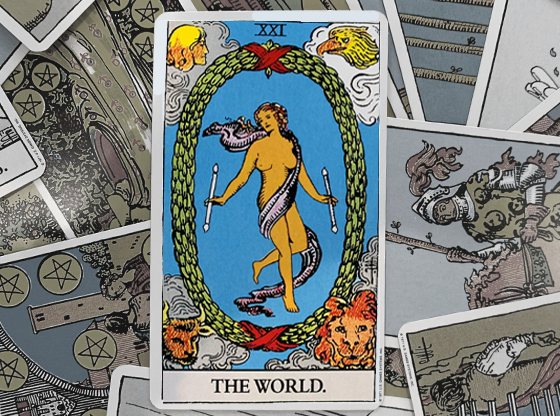 In the top left position, the Eight of Swords revealed the first possible scenario. 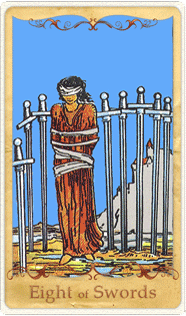 This card depicts a woman who has wandered away from the safety of the world she knows, and trapped herself in a situation that may lead to an unhappy and uncertain fate. Bound and blindfolded, she wanders the beach alone, too far from anyone else to be able to call for help. At the moment the tide is low, but should it turn, she will likely be swept out to sea to drown. For Nancy, this meant she was likely blinding herself to the house’s reality. As much as it appealed to her on an emotional level, the ramifications of serious financial and structural considerations could not be ignored. 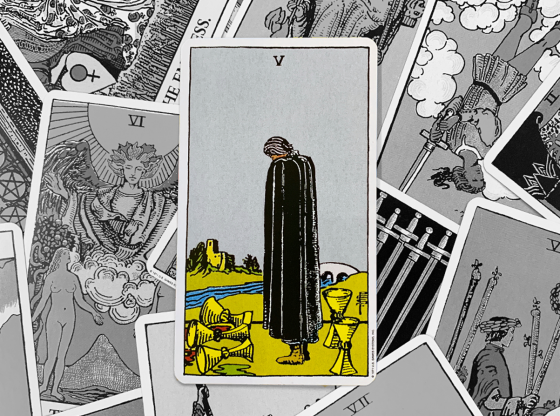 The top right card spoke of a second possible outcome that was much more desirable. 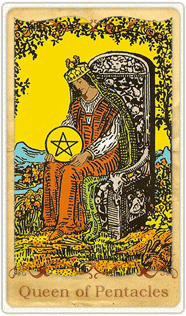 Here, the Queen of Pentacles sits on a throne in her lush garden. 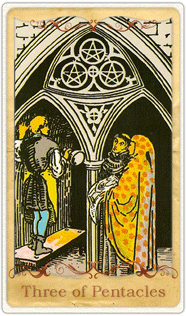 Nature blooms around and enfolds her, but this multi-faceted card augurs nurture, as well. Physical, emotional, and financial needs are all met here, but the end result is not something that happened quickly or by chance. This garden is loved, but also well planned, well tended, well maintained. The second possibility suggested that the house had all the right elements, but that it would take careful husbandry to create and sustain the ideal conditions for growth. 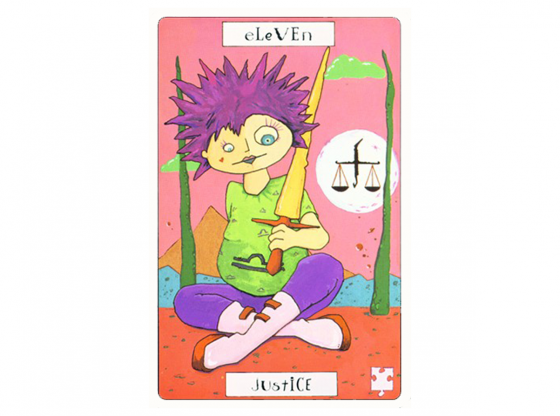 Beneath the Eight of Swords, the Ten of Wands revealed that the force pulling Nancy toward the first outcome was a tendency to bite off more than she could chew. 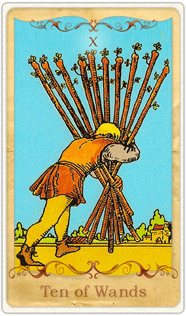 This card depicts a man bent over and overburdened by an enormous load that he is attempting to carry on his own. 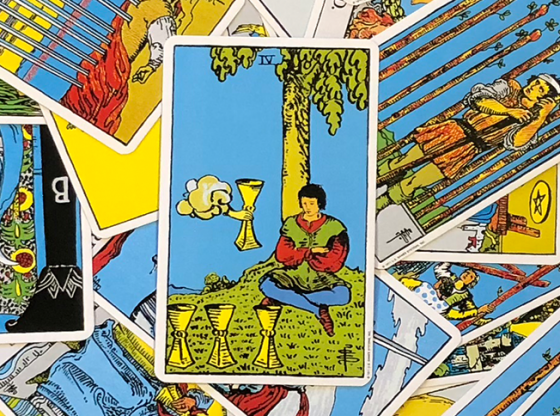 While he may be able to get that many wands off the ground, it’s unlikely that he will be able to carry them very far without them crashing to the ground. Nancy admitted that the cost of the structural engineering report was substantial, and she’d hesitated to go ahead with it. 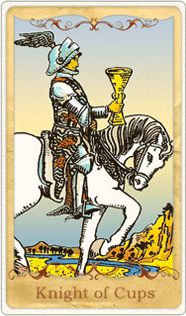 The Knight of Cups represented the force drawing Nancy toward the second possible outcome. In it, a fresh-faced youth, full of vigor, sits astride a white steed. 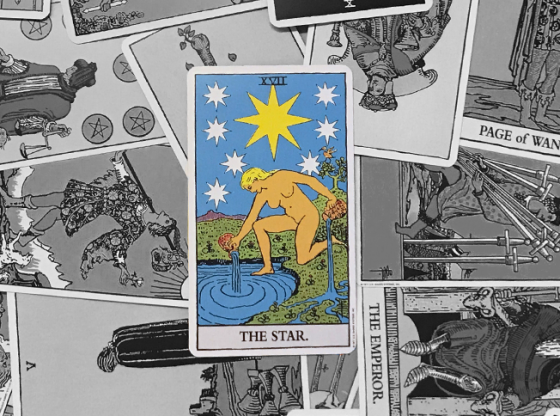 While for the moment, they are at a stopping point, the card signifies being on the cusp of great change. A major clue here rests in the landscape: The place the knight has just ridden from looks to be a wasteland. While the river they are facing represents new life and revitalization, the cautionary note inferred is that both horse and rider appear shiny and unscathed by the dirt and weariness one usually associates with travel. For Nancy, it could well mean that her tendency to idealize the house was not taking all the facts into account. Not that it necessarily meant the home of her dreams wasn’t attainable, but before moving forward, it was time for the rose-colored glasses to come off. 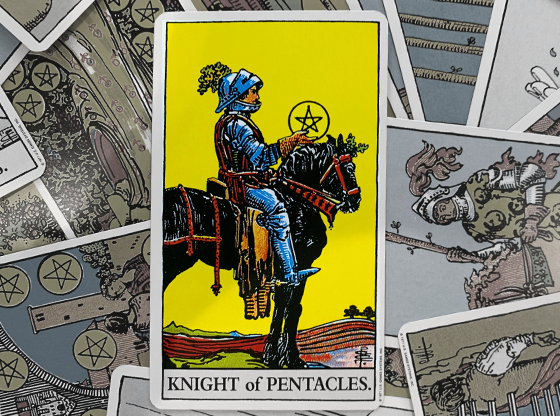 The final card in the spread, the Three of Pentacles, revealed the critical factor that would decide which of the two scenarios Nancy might expect to come about, should she embrace it. 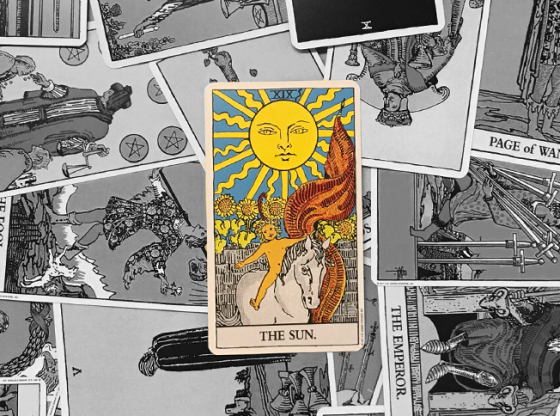 I took this card, which represents a meeting of minds and the willingness to work in concert with others, as a very positive sign. Pictured are a stonemason, who is in the process of checking the details of a wall he’s constructing, along with a monk and a nun who are holding out a blueprint for the mason’s inspection. By consulting a master craftsman, the two assure themselves that the cathedral they are building will rest on a foundation that can truly stand the test of time. I hadn’t heard from Nancy in several months, but that isn’t unusual when someone is making a move. Pretty much every waking moment is caught up in the details of contracts, and getting everything packed and ready to go. I knew she’d get back in touch when the dust cleared. I was glad Nancy had decided to take a real-world look at her options. It had made all the difference between spinning daydreams that might lead to headaches, heartaches and financial stress, and making her dreams come true. 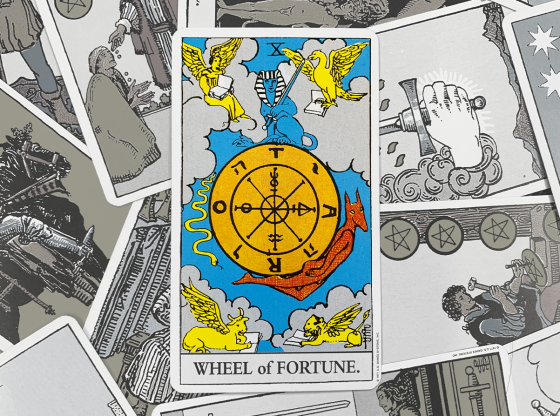 If you’ve got an important decision to make, and can’t choose which path to take, a KEEN advisor can point you toward the outcome you can really live with. Is My Current Partner Good Parent Material?